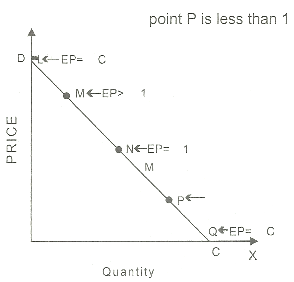 The percentage method measures price elasticity of demand by dividing the percentage change in amount demand by percentage change in price of commodity. The elasticity of demand is unity, greater than unity and less than unity. Demand is unity if change in demand is proportionate to the change in price. Demand is greater than unity when change in demand is more than proportionate change in price. The demand is less than unity if change is less than proportionate change in price. The coefficient of price elasticity of demand is always negative because change in price brings a change in demand in opposite direction. Negative signs are usually disregarded. A consumer buys 5 kg of commodity at $10. If the price falls to $6 the consumer buys 6 kilograms. Elasticity in this case is less than 1. A consumer buys 5 kg of commodity at $10. If the price rises to $12 the consumers buys 4 kilograms. Elasticity in this case is1. Marshal evolved total expenditure (outlay) of consumer or total revenue of seller as measure of elasticity. Total expenditure of a producer is compared before and after change in price. Total outlay is equal to price multiplied by quantity demanded. This method of the measurement of price elasticity of demand tells us whether demand for a commodity is elastic or greater than unity. When fall in its price leads to increase in total expenditure in it and a rise the price causes decrease in total expenditure. Demand is equal to unity when total expenditure remains the same whether there is increase in price or decrease in price of goods. Demand is said to be inelastic or less than unity when total expenditure decrease with decrease in price and increase with increase in price. The total expenditure remains unchanged at $24 in unitary elastic demand. There is fall in price from $12 to $6 and $3, the total expenditure remains unchanged at $24. When there is rise in price from $3 to $6 and $12, the total expenditure remains unchanged at $24. 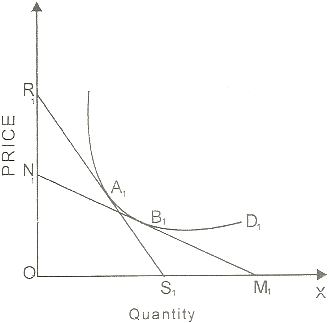 The elasticity of price is = 1 or unitary elastic demand whether there is increase in price or decrease in price. The total expenditure rises from $24 to $36 and $48 respectively with the fall in price from $12 to $6 and $3. The total expenditure falls from $48 to $36 and $24 respectively with the rise in price from $3 to $6 and $12. The elasticity of price is > 1 in this case. The total expenditure falls from $24 to $18 and $12 respectively with fall in price from $12 to $6 and $3. The total expenditure rises from $12 to $18 and $24 respectively with the rise in price from $3 to $6 and $12. The elasticity price is < 1. There is inelastic demand in such case. This method is simple as it classifies the elasticity into three categories. Its drawback is that it fails to measure elasticity in exact figures. The point elasticity of demand is proportionate change in quantity demand in response to very small proportionate change in price. The point elasticity concept is useful when change in price and the consequent change in quantity demanded is very small. Marshal suggested this method. It is also called geometrical method because graph is drawn to show the demand curve. This method is explained with the help of (1) straight line demand curve and (2) convex demand curve. 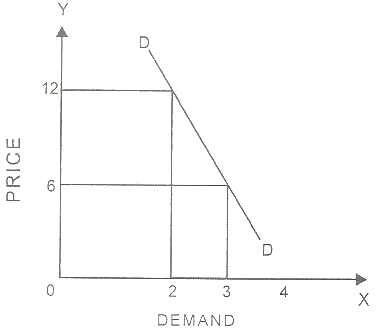 The diagram shows a straight line demand curve. We join both sides of the straight line demand curve with the two axes at points D and C. Elasticity at any points is equal to the ratio of the distance from the point P to the X axis and the distance to the Y axis. 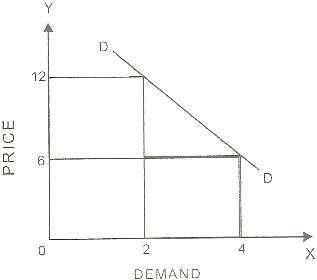 In the diagram the point N is half way between D and C. The elasticity of demand is = Ep = NC / ND. The elasticity is equal to 1 at this point. Similarly at point M elasticity is greater than 1. The elasticity at point P is less than 1. There is convex demand curve DD. Suppose we want to check price elasticity at point A. we can draw a tangent RS at the point A. the elasticity is found as AM / AR. Similarly for finding out elasticity at point B we draw a tangent at this point to the demand curve. The elasticity at this point is given by the ratio of the distance along the tangent to the X-axis divided by the distance of the Y-axis. The concept of ARC elasticity was provided by Dalton and than it was further developed by Lerner. This method for the measurement of price elasticity of demand is applied when the change in price is somewhat large or the price elasticity over an ARC of demand is provided. 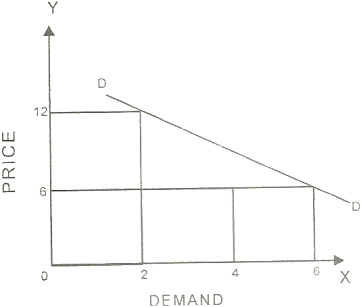 ARC elasticity of demand is the elasticity between distinct points on the demand curve. It is an increase of average responsiveness to price change shown by a demand curve. Any two points on demand curve make an ARC. 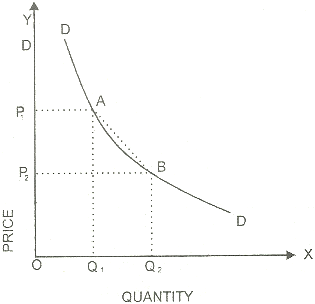 The area between A and B on the DD curve is an ARC that measures elasticity over a certain range of price and quantities.